Himachal Pradesh is a state in North India with Jammu and Kashmir in north as border, Punjab in west and Haryana and Uttarakhand in the south east and by Tibet in the east.Obviously the cuisine of Himachal Pradesh has influence of Punjabi and Tibetan style of cooking. Himchal Pradesh people like very spicy food and the most important food is dal and rice.Rotis are made in daily basis, traditionally Himachali cuisine is dominated by wheat bread and red meat.However like the rest of North India, Himachali cuisine also goes for basic dishes like rice, lentil broth,dish of vegetables and rotis, eventhough they love to make thick, rich gravies with aromatic spices abundantly.Pahari cuisine is a part of Himachal Pradesh cuisine and its have it origin from the beautiful Kangra valley which is in Himalayas. Pahar means mountains and thus their cuisine is named as Pahari cuisine.Some of the popular dishes from this Pahari cuisine is Katta, Palda, Channa Madra,Tudkiya Bhath,Mungodi curry,pakodas etc. I chosed this potatoes in yogurt gravy aka Aloo Palda from here, this dish goes for a yogurt based gravy and its one of the easiest and delicious gravy i have tasted till now. Potatoes cooked slowly in rice-yogurt gives this wonderful looking dish and the cooking process is very simple to make this dish very much quickly. I loved this dish thoroughly with rice served along with pickle and papads. A different gravy to cook and enjoy with rice definitely. Grind the rice with green cardamoms as fine paste and keep aside. Add 4cups of water to the yogurt, whisk it and keep aside. Heat oil, fry the black cardamom, cinnamon stick,cloves, asafoetida powder, cumin seeds. Add the onions and cook until they turns transculent. Now add the coriander powder, turmeric powder, garam masala,salt. Saute for few minutes, add the sliced potato finers, cook in medium flame until the potatoes are almost cooked. Now add the grounded rice paste, whisked yogurt,keep stirring on medium flame until the gravy turns bit thick. Any dish with aloo my hubbys favourite. This potato dish also looks rich and flavourful with the addition of raw garam masala spices. Wonderful potato gravy .Look so yummy .easy to try and wonderful to have . Kids love anything with potatoes here and this one would be a rockstar here. Will try this and let you know.. Simple n interesting recipe,need to try it..Now i know all cuisine name from BM.planned to try some dish..Thxs gals!! My best friend is from HP, she makes the most awesome palda. Its a stunning dish. looks fantastic. interesting enough to add to the regular menu. would definitely be a nice variation to the regular sambar, rasam we make at home. 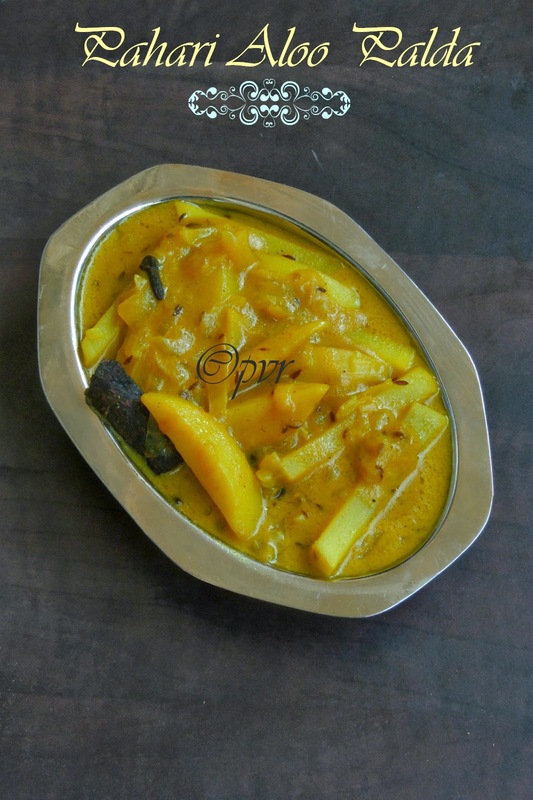 Looks interesting to know new recipes..potato curry looks great. Simple, yet flavorful dish...and sad always you have mastered it..looks tempting. very interesting and adorable potato curry. Yummy and delicious! That is a yummy looking dish..
We all love coconut based gravy. I must try this dish. It has turned out great. Looks very colorful. I was contemplating to go with this or madra and picked the latter. As you say, a different gravy, and differently sliced potato - like fries - will make it sometime. Loved this Aloo curry. Looks very tempting. Good one. I should try this yogurt based gravy for my kids! Priya I want this gravy it looked so delicious I want it. Nice gravy Priya. I think the grinding of the green cardamom and the raw ricce will give this gravy a lot of body! Lovely color! Same pinch Priya! I made this too.And I loved it!